1905 Philipp Lenard Physics "for his work on cathode rays"
1914 Robert Bárány Medicine "for his work on the physiology and pathology of the vestibular apparatus"
1925 Richard Adolf Zsigmondy Chemistry "for his demonstration of the heterogeneous nature of colloid solutions and for the methods he used, which have since become fundamental in modern colloid chemistry"
1937 Albert Szent-Györgyi Medicine "for his discoveries in connection with the biological combustion processes, with special reference to vitamin C and the catalysis of fumaric acid"
1943 George de Hevesy Chemistry "for his work on the use of isotopes as tracers in the study of chemical processes"
1961 Georg von Békésy Medicine "for his discoveries of the physical mechanism of stimulation within the cochlea"
1963 Eugene Wigner Physics "for his contributions to the theory of the atomic nucleus and the elementary particles, particularly through the discovery and application of fundamental symmetry principles"
1971 Dennis Gabor Physics "for his invention and development of the holographic method"
1986 John Polanyi Chemistry "for their contributions concerning the dynamics of chemical elementary processes"
1994 George Olah Chemistry "for his contribution to carbocation chemistry"
1994 John Harsanyi Economics "pioneering analysis of equilibria in the theory of non-cooperative games"
2002 Imre Kertész Literature "for writing that upholds the fragile experience of the individual against the barbaric arbitrariness of history"
2004 Avram Hershko Chemistry "for the discovery of ubiquitin-mediated protein degradation"
Imre Kertész was a Hungarian author and recipient of the 2002 Nobel Prize in Literature, "for writing that upholds the fragile experience of the individual against the barbaric arbitrariness of history". He was the first Hungarian to win the Nobel in Literature. His works deal with themes of Nazi Holocaust, dictatorship and personal freedom. He died on 31 March 2016, aged 86, at his home in Budapest after suffering from Parkinson's disease for several years. 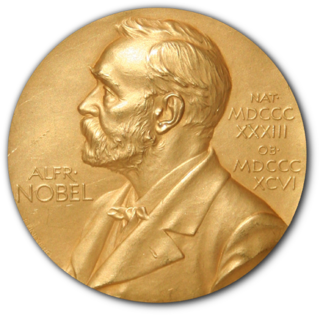 The Abel Prize is a Norwegian prize awarded annually by the King of Norway to one or more outstanding mathematicians. It is named after Norwegian mathematician Niels Henrik Abel (1802–1829) and directly modeled after the Nobel Prizes. It comes with a monetary award of 6 million Norwegian Kroner (NOK). Avram Hershko is a Hungarian-born Israeli biochemist and Nobel laureate in Chemistry. ↑ "All Nobel laureates from Hungary". www.mta.hu. Archived from the original on 6 October 2015. Retrieved 17 October 2015.